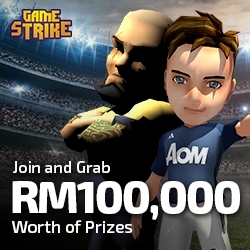 Kuala Lumpur, Malaysia, June 08, 2018 –(PR.com)– Gamestrike today release the second mobile game tournament “Cross Strikers” and continues racks up a total of RM100,000 worth of prizes to be won by Digi customers. The second mobile game tournament for Gamestrike "Crossy Strikers" is an "arcade" game that places you in the shoes of a striker in an exhilarating dash towards the opponent goal. Players can avoid the defenders and various obstacles to score your ultimate goal and customize the striker in various different jerseys and shoes. In addition to the game, players can compete with one another by uploading their scores to an online tournament scoreboard. There is no limit to the number of score uploads, thus allowing gamers unlimited number of tries to obtain the highest ranking on the scoreboard. Powered by Gamestrike tournament portal, Crossy Strikers can be downloaded via Google Play and the iOS App Store.